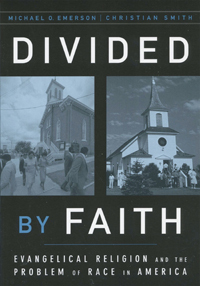 It was ten years ago that my Christianity Today colleague, Mark Galli, and I moderated a forum based on issues raised by the then-new book Divided by Faith: Evangelical Religion and the Problem of Race in America by Michael Emerson and Christian Smith. That CT forum featured an illustrious panel of pastors and theologians, including Elward Ellis, Robert Franklin, Charles Lyons, John Ortberg, and J. I. Packer. We discussed the book’s central theme (that evangelical theology actually contributes to the race problem in America) and grappled with its implications for the church. It was an important moment and hopefully a helpful article for CT’s readers. Well, in a stunning reminder of how quickly time flies (and how old I’m getting), we are now looking at the ten-year anniversary of that seminal book’s release. In commemoration of this event, Indiana Wesleyan University is hosting “Divided by Faith: A Decade Retrospective” next weekend (Oct. 15-16). This unique conference will use that 10th anniversary as an occasion to reflect on the progress and missteps made in the arena of racial reconciliation and diversity among evangelicals over the past decade, and will feature a variety of scholars and panel discussions. You can find out more here. I’ll have the honor of interviewing Michael Emerson during the Friday-evening session. If you’re in the area (or can swing a quick flight to Indiana), please think about attending. I’d love to see you there.